Micromax Canvas Engage A091 has been available online for purchase at price of RS 6,000. Company has recently launched the Micromax Unite 2 A106 with android 4.4 Kit Kat and now its small brother the Canvas Engage A091 has been spotted online. The handset is already available from retail shops in India. It doesn’t seems to be a tough competitor for the Motorola Moto E, although Unite 2 A106 is still the Main rival. The Ao91 comes with downgraded specifications, as it has limited 512MB of RAM, VGA front cam and 1500 mAh battery. At this price TAG it would compete ( VS ) with Videocon A29, Karbonn Titanium S1 Plus and Iball Andi 4.5D Royale. 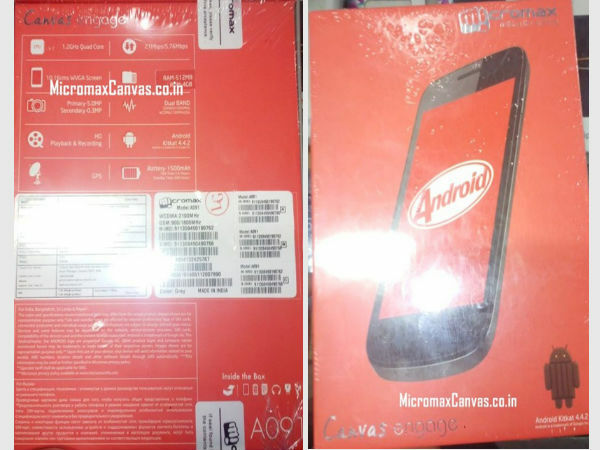 You can also see the leaked image of the phone ( which is not a leak) as it is available in retail shops. The new MMX A 091 Engage comes with a 4inch display having 400 x 800 pixels resolution. It gains the strength from 1.2GHz 4-core processor paired with 512MB of RAM. The phone is accomplished with 5-megapixel primary camera and a VGA front camera. It runs on Google’s latest Android 4.4 Kitkat operating system. The Ao91 houses a 1500 mAh battery which offers 5.5 hrs of talk-time and 200 hours of standby time. The phone might support Dual SIM ( not mentioned in BOX pack) and has 3G connectivity. It is capable of recording 720 P HD videos. Company has not officiously launched the handset yet, you can buy it from ebay India. MMX surprised the peoples by launching the A1o6 Unit 2 but the A-091 Engage might not engage more peoples because of low end specs. But at this price tag it is still a nice handset. BUY IT NOW FROM AMAZON India. It should rec in 720p HD as clearly mentioned on the box pack and company's official website. If you already own it GO TO CAMERA APP settings and select the Video quality / Video resolution to highest. Good but not the best one. No new except version. Think with cool mind, what we can do with only 512 MB RAM. Not bad and not best. We have to say its good.